eBay is a multinational e-commerce Corporation, facilitating online consumer-to-consumer and business-to-consumer sales. eBay is one of the largest online marketplaces in the world. It’s a leading website where users can buy and sell their products globally. One can open the business’s potential by expanding the product presence to largest online marketplaces like eBay. Webkul’s WooCommerce eBay Connector plugin will integrate your WooCommerce store with eBay store because managing them separately is enough to sap all of the time and to drain profits. This plugin provides two-way integration which means admin can sync the products from WooCommerce site to eBay and vice versa. The admin can import information related to product, categories, and orders from eBay to WooCommerce store. The plugin allows the admin to import eBay store category directly to the WooCommerce site to keep both the stores more uniform. And, can also export the product from the WooCommerce store to eBay store. This will list the items from WooCommerce site directly onto your eBay account. The admin can provide the eBay condition & specifications, refund policy, shipping details for exported products. For this, you need to login to WordPress Admin Panel and Under the Dashboard hovers your mouse over the “Plugins” menu option which brings out a Sub-Menu and then select the “Add New” option. Then, you will see an option on the top of your page that is “Upload Plugin”, click the option to upload the zip file. How to get eBay API credentials? 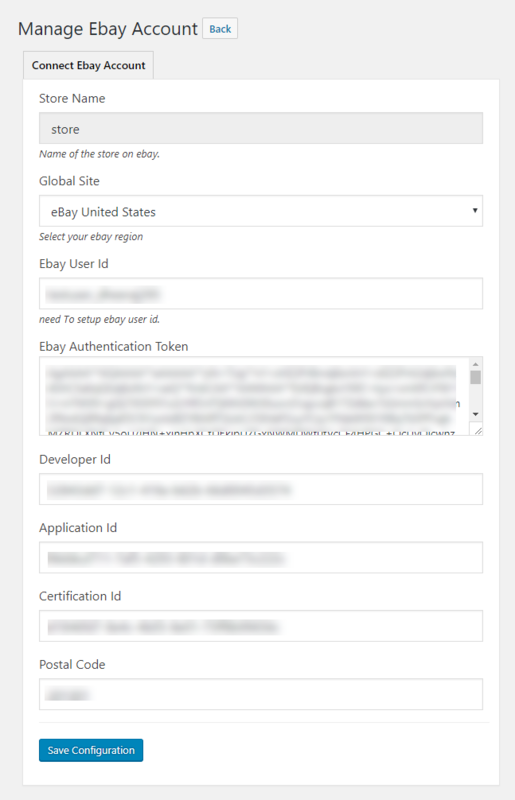 In order to do the module configuration, you will need to fill your eBay developer keys (App Id, Cert Id, Dev Id, User ID, Auth Token) from https://developer.ebay.com/. 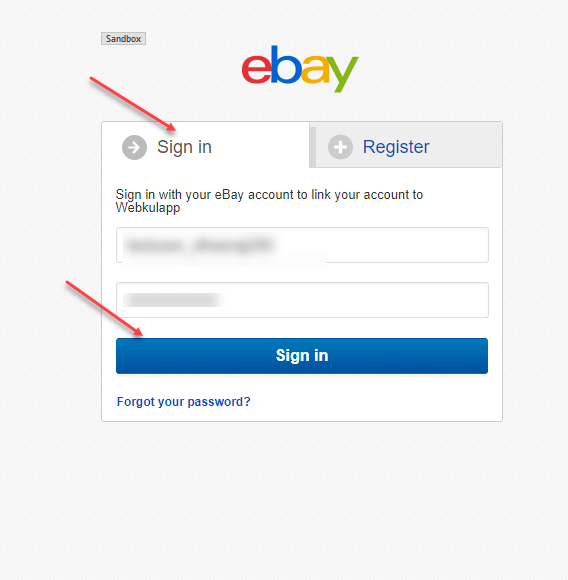 Step1: To create a new account go to developer.ebay.com and click on the sign in/Join link. Step 2: Now, create a username and password for your account and then click the join button. Step 3: After the above step, you need to create an app. Enter the app name and choose the environment to generate your key set. Note that app name is not saved until you generate the keys set. Step 4: After clicking on the Create a Keyset link(for the environment you choose), you need to confirm the primary contact for this account first and then you can click Continue to Create Keys button. Step 5: Now you can see your selected environment key. For creating the production keys just click on the “Create a Key Set” and you will get your production keys. Step 6: For generating the User Token go to your Application keys page. In the App ID row of the Sandbox keyset, click the User Tokens to access the Tokens page for your Sandbox keyset. Step 7: After you click on “User Tokens” in the snapshot above, you will see a “Sign in to Sandbox” button. Click it to access the sandbox account. Step 8: Now, enter your Sandbox Username and Password. Step 9: After clicking the “Sign in” button, you will see another page where you have to click the “Agree” button. Step 10: Lastly, you will be redirected back and will get the App Token. After the successful module installation, the admin can configure the module settings. 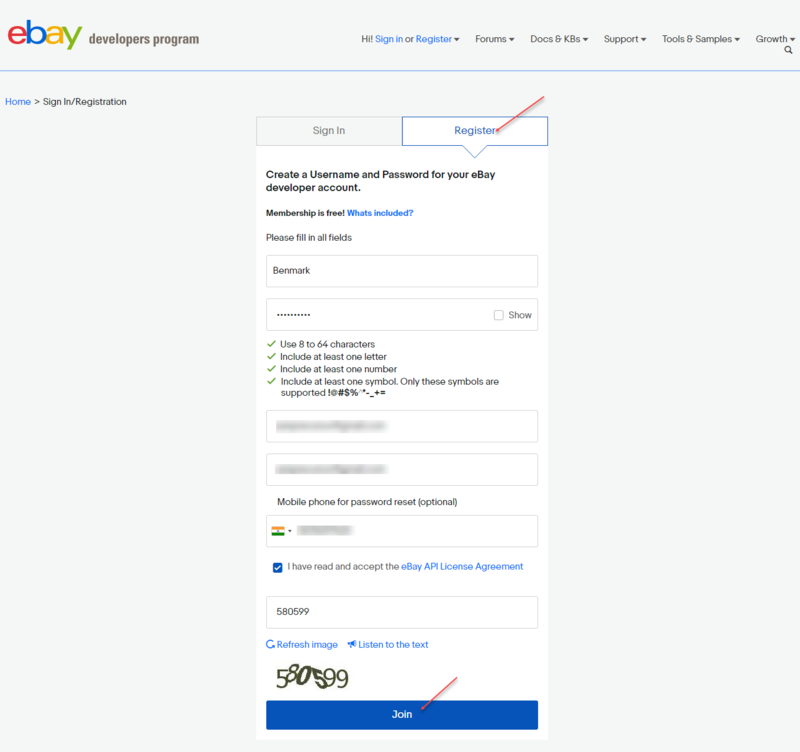 The admin will have two menu options – “WooCommerce Multi Account eBay” and “eBay Settings” in the admin account to manage the eBay connector plugin as per the below image. To configure the module settings, the admin will click on the “eBay Settings” menu option. This will redirect the admin to the eBay Settings page as per the below image. Mode: Select either Sandbox mode or the Development mode. Default Category: When eBay category is not mapped with WooCommerce then products will get assigned to this category. eBay Imported Order Status: Set default order status for the order which gets imported from eBay. Default Product Quantity: Set default product quantity for a product which exported to eBay if product quantity is zero in the store. PayPal Email Address: Enter your PayPal email ID. Define Return Policy: Select either Returns Excepted or Not Accepted. This option is for the exported products. Returns Within: Select the return duration for the exported products. Pay By: Select who will pay for the returned product – the seller or the buyer. Other Information: Write any information about Return Policy for exported products. Default CountryCodeType(Required While Product Export): Set default country code which will be used while exporting the product. Listing Duration: Select Good Till Canceled, 1, 3, 5, 7, 10, or 30 days. It is the duration of exported products on eBay. Dispatch Time: Select the dispatch time for exported products on eBay. Select 1, 2, 3, 4, 5, 10, 15, 20 or 30 days. Shipping Service Priority: Enter the shipping service priority. Shipping Service: Select the shipping service for the WooCommerce product created on eBay. Shipping Service Cost: Set shipping amount that applies to the product when syncs eBay. Shipping Service Additional Cost: Additional shipping amount that applies to the product when syncing with eBay. This applies when a customer purchases same product in additional quantity. And Shipping Service Additional Cost should be less than Shipping Service Cost. Shipping Time Min: Set minimum shipping time for the exported products. Shipping Time Max: Set maximum shipping time for the exported products. Shipping Free: Select either Yes or No. 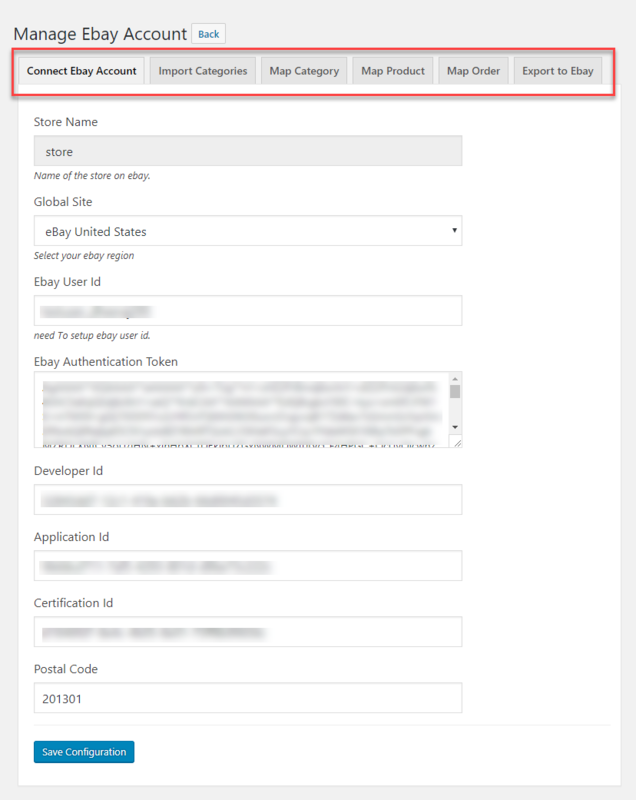 Once the admin is done with the module configuration, then the admin needs to add eBay account credentials. For this, the admin will click on the “WooCommerce Multi Account eBay” menu option for managing and adding eBay accounts. After clicking on the “WooCommerce Multi Account eBay”, the following page will open showing eBay accounts list with the store ID, store name, and eBay user ID details. 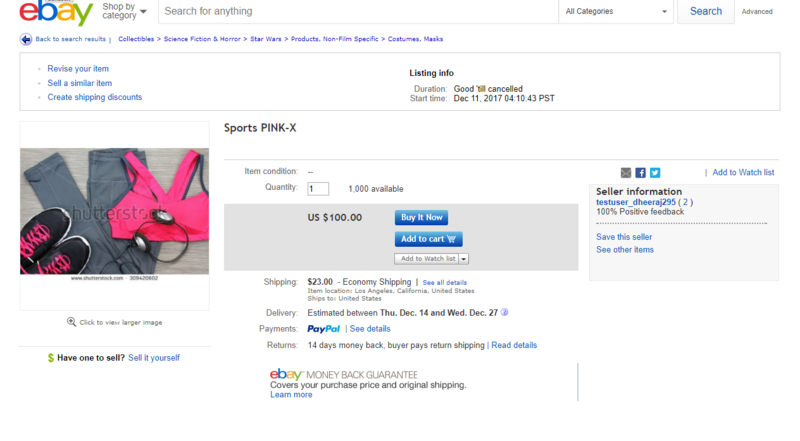 Edit – edit the eBay account details by clicking on the “Ebay Connect” button. Delete – remove the existing eBay account from the list by selecting “Delete” from the “Bulk Actions” drop-down list. Add New Ebay Account – add/create new eBay account by clicking on the “Add New” button. After clicking on “Add New”, the admin will navigate to the “Manage eBay Account” page. After filling all the information, the admin has to click on “Save Configuration” for saving the information and continue to edit the eBay account details. 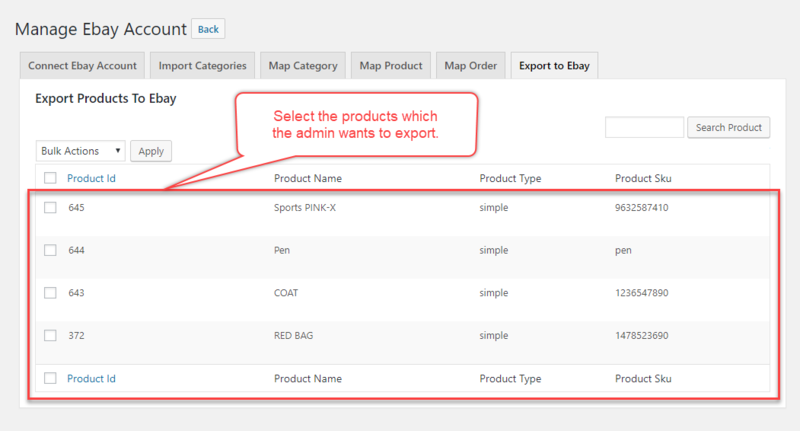 The admin can map categories so that imported products automatically get assigned to the mapped category only. To map the categories, the admin needs to import the categories and then create the imported categories. 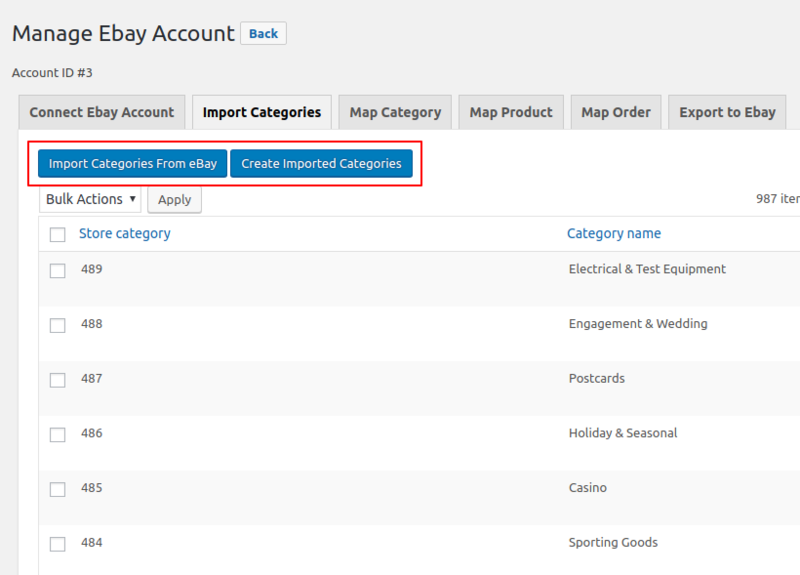 As per the image attached below, the admin can see the “Import Categories From eBay” and “Create Imported Categories”. Here, the admin can see the complete list of the WooCommerce store categories. The admin will first click on the “Import Categories from eBay” to import the categories to the WooCommerce store. Here the admin is provided with the feature to import categories on the basis of Start Date and End Date. The admin will select the dates and the categories created between those dates will get imported here. 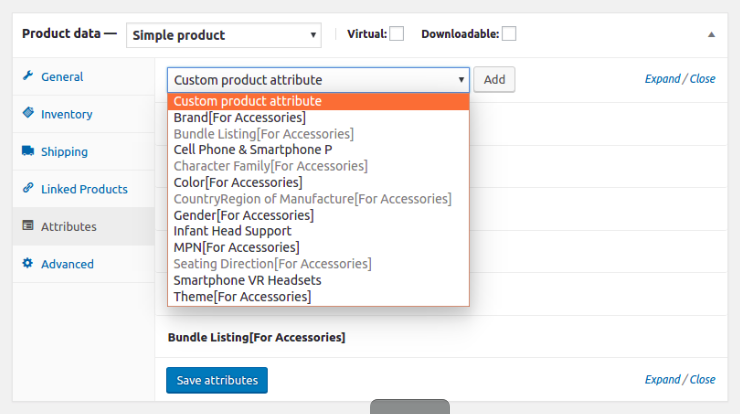 The admin will click on “Create Imported Categories” to create the imported categories in the WooCommerce store. After this, the admin will map the created categories by clicking on the “Map Categories” tab. Under this tab, the admin can see a “Map Categories from eBay” tab as per the image. At the time of mapping, eBay condition & specification will be created as product attributes in WooCommerce. 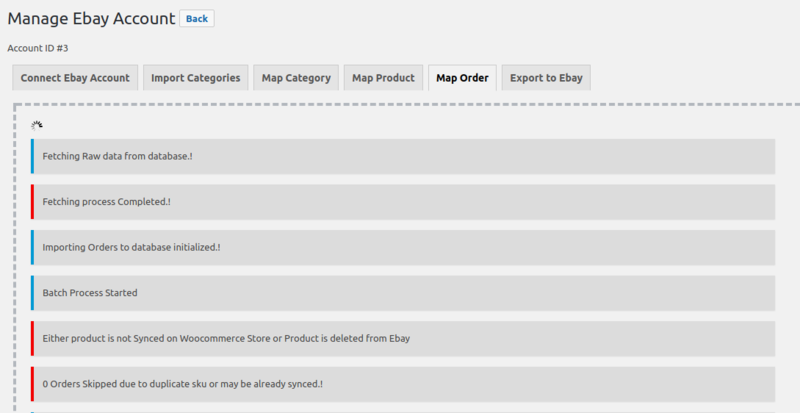 On clicking the “Map Categories from eBay”, the admin will see a new page as per the below image. Only one category can be mapped at a time. You cannot map the parent categories. One needs to select the sub-category for mapping. After mapping the categories, the admin can view them in the list as per the image. 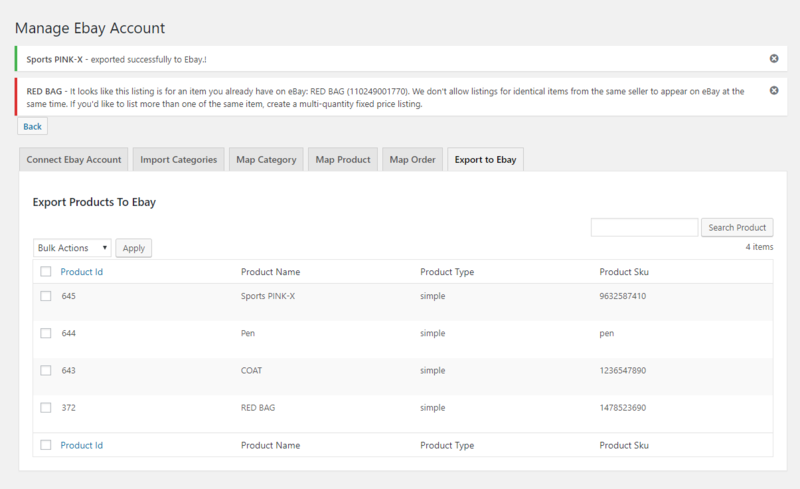 Category Condition – After mapping the one to one category, the mapped store category’s products will show the field of eBay category condition at the add/edit page. The conditions provided for the category has to be provided for successfully exporting the products to eBay. 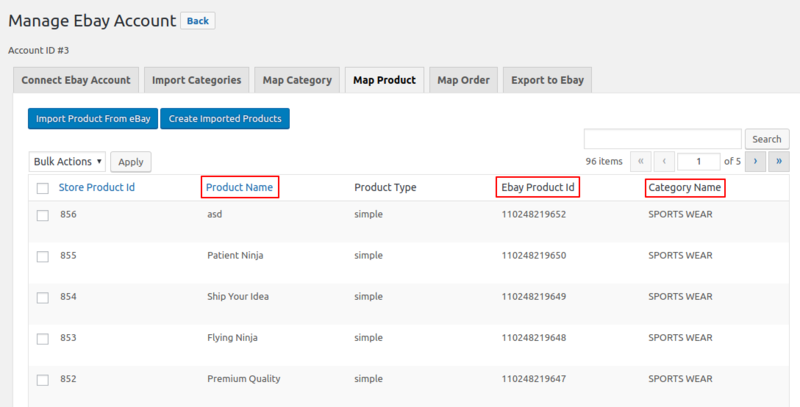 Category Specification -After mapping one to one category, the mapped store category’s products will show the category specification of eBay as global attributes at the add/edit page – product data. The above global attributes values has to be provide for the mapped store category’s product. All attributes with mapped store category name in the format – Attribute name[mapped category name] has to be provided with the values by the admin. The admin can synchronize the products on both the stores with the help of this plugin. 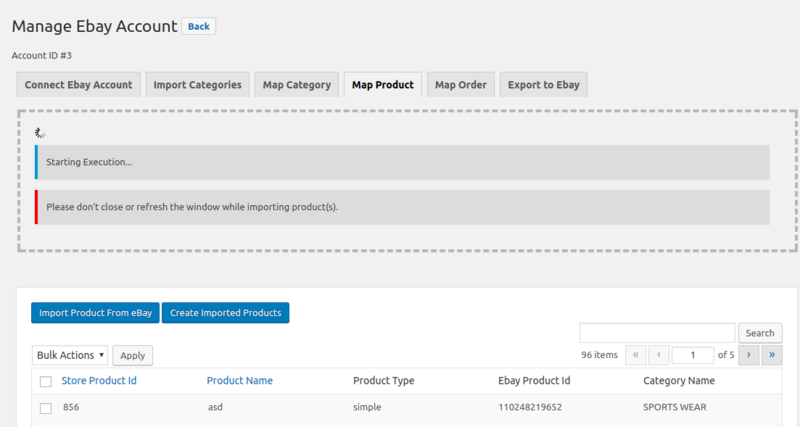 As per the below-attached image, the admin can see “Import Products From eBay” tab and “Create Imported Products tab” under Map Product. The admin will first click on the “Import Products from eBay” to import the products to the WooCommerce store. This will create the temporary product data and get stored in the WooCommerce store. 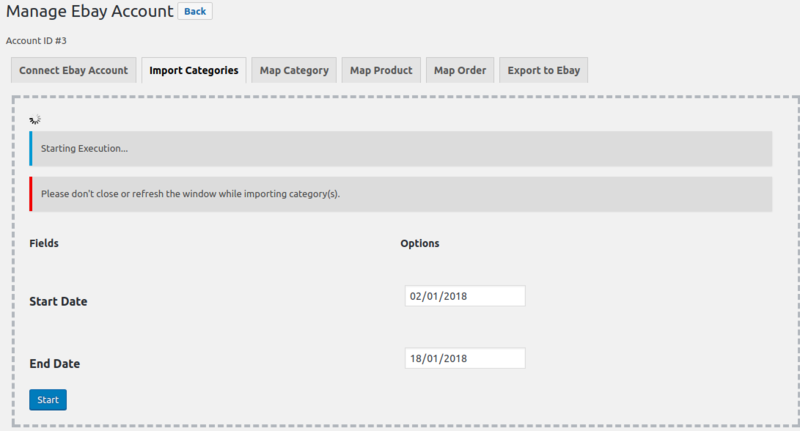 The admin can select the Start Date and End Date to import products from eBay. The products that have been added between these dates will get imported here. 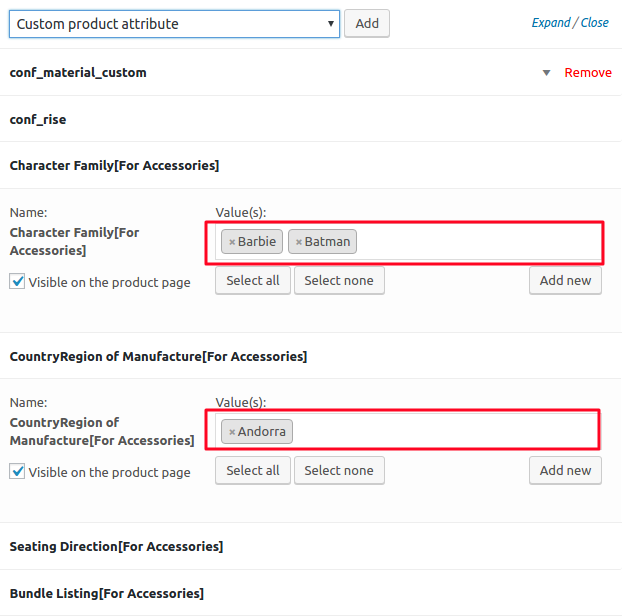 Now the user will click on “Create Imported Products” to create the imported products in the WooCommerce store. The user can create the product imported between a time frame by selecting the start date and end date for the same. Now click on the Start button to initiate the process. After creating the products, the admin can view them in the list as per the image. If the category mapping is done for the eBay product category, then the imported products will not be assigned to the default category. The imported products automatically get assigned to the mapped category. The admin can import the orders from eBay store to the WooCommerce store with the help of this plugin. As per the below-attached image, the admin will see tabs – “Import Orders from eBay” and “Create Imported Orders”. The admin will first click on the “Import Orders from eBay” to import the orders to the WooCommerce store. 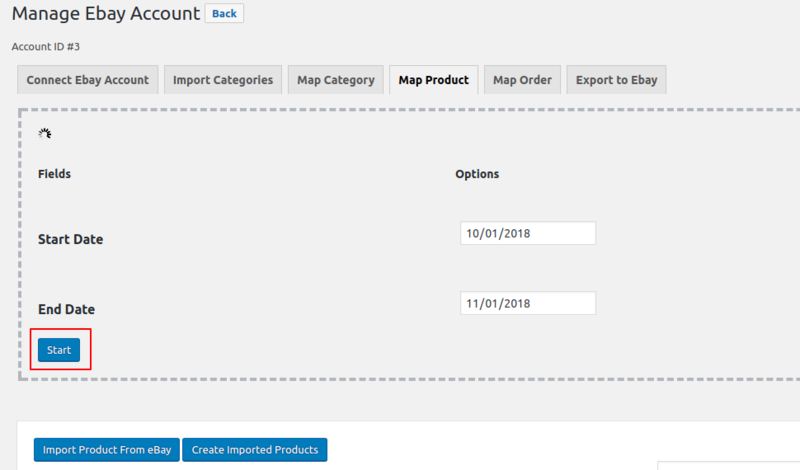 Then click on “Create Imported Orders” to create the imported orders in the WooCommerce store. After mapping the orders, the admin can view them on the list. The admin can export the products from WooCommerce store to eBay store with the help of this plugin. As per the below-attached image, the admin will see a tab “EXPORT TO EBAY”. Here, the admin simply selects the products from the visible product list which the admin wants to export. The admin will get the success message for the products which have got imported successfully. Else, will show the error message for duplicate importing as per the below image. The below-attached image will show how the exported products will be visible at the eBay store.